It’s probably no surprise that rising interest rates have a significant impact on your pocket book. But how much of an impact? The True Cost may shock you! Knowing you like to stay informed, we have provided three real-world home buying scenarios in the graphics below. From these hypothetical comparisons, we hope you can get a better idea of the true cost of the interest rate hikes that are expected in the near future. 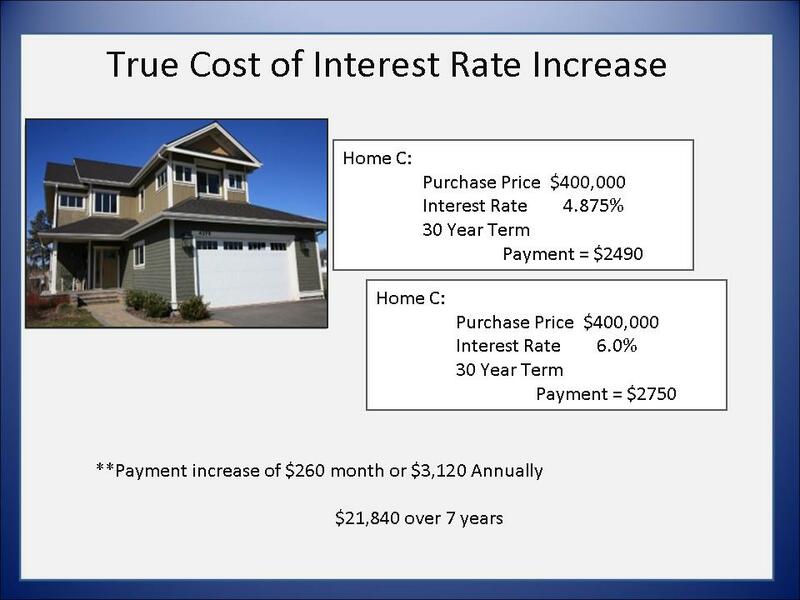 Assuming that you remain in your new home for 7 years, it is very clear the HUGE impact of rising interest rates. WAITING TO BUY could cost you THOUSANDS of dollars! 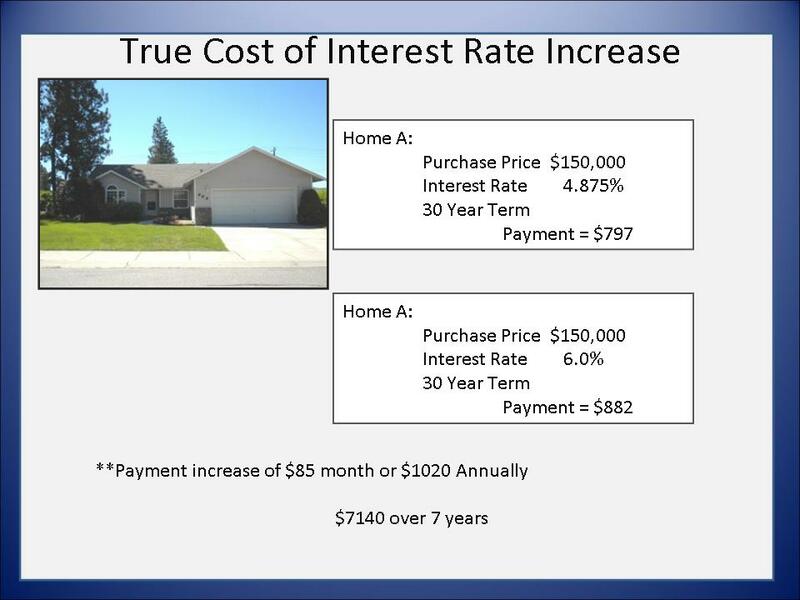 At the current interest rate of 4.875%, the monthly payment will be $797. for a total annual increase of $1020! you will be spending $7140 MORE! What could you do with an extra $7140? you will be spending $11,760 MORE! What could you do with an extra $11,760? Thinking of buying? Now is a great time, if you want to save $$ in your monthly budget, as well as over the life of your potential mortgage. Are you waiting for a lower purchase price? 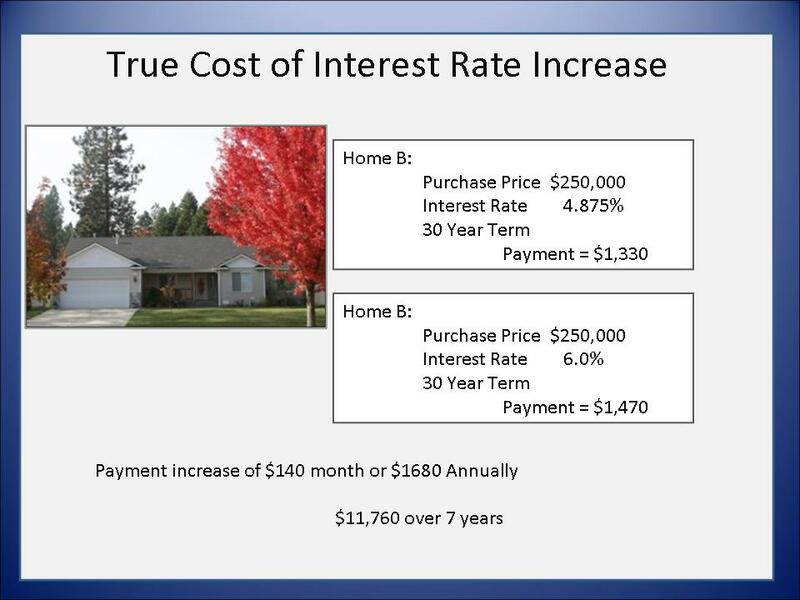 The “savings” of a few thousand dollars off the purchase price will actually COST you THOUSANDS when the interest rates rise. Don’t wait to make your next Real Estate move. High Inventory and Low Interest Rates! As experienced REALTORS®, and long-time North Idaho residents, we can provide an impressive list of professionals whom we’ve come to trust over the years. 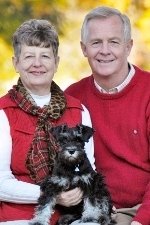 With our expertise in guiding our clients through all kinds of Real Estate transactions, we are uniquely qualified to help you achieve your real estate goals in 2011! We’ll help you navigate through every phase of the process.